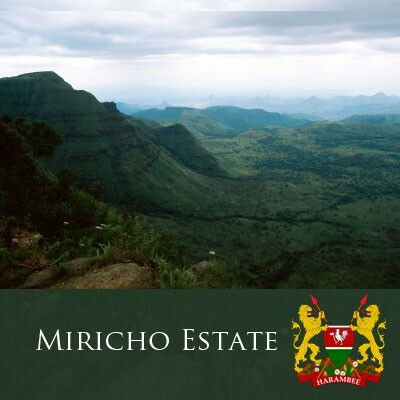 Located near Thika in the central highlands of Kenya, Miricho Estate produces a full-bodied AA coffee with good aroma and the distinctive winey aftertaste that Kenya coffee is noted for. Our grower, Python Mwangi, is a past chairman of Kenya's national coffee board. Our estate coffees are always pure, never blended with inferior beans. We practice and promote complete transparency in the marketing and labeling of our gourmet coffees, so you always know exactly what you are buying. Coffee was first cultivated in Kenya in 1893 by the Fathers of the Holy Spirit, and the growing Kenya coffee industry developed around these early mission farms. Today, Kenya is well known for its coffee industry, which employs an estimated six-million Kenyans directly or indirectly. The majority of coffee beans in this country are grown by small land holders. Kenya's mountainous terrain and acidic soil provide optimal growing conditions, though production has decreased significantly over the past twenty years. Quality control is taken very seriously by the Kenyan coffee exporters. All coffee beans are graded after they are milled, with AA as the highest grade, denoting the largest sized beans. AA coffee is generally considered to be of a higher quality than the other grades and fetches the highest prices at the weekly auctions where coffee is traded. As with all of our gourmet coffee, Martinez & Company carries only top grade Kenya AA coffee, so that you can always be sure that you are buying the best Kenyan coffee available. Our AA coffee from the Miricho Estate in the Central Highlands is noted for its rich, winey flavour and, until recently, was almost exclusively sold to the coffee-loving sheiks of the Arabian Gulf. Now, you too can sample this exquisite AA coffee from Kenya's Miricho Estate.